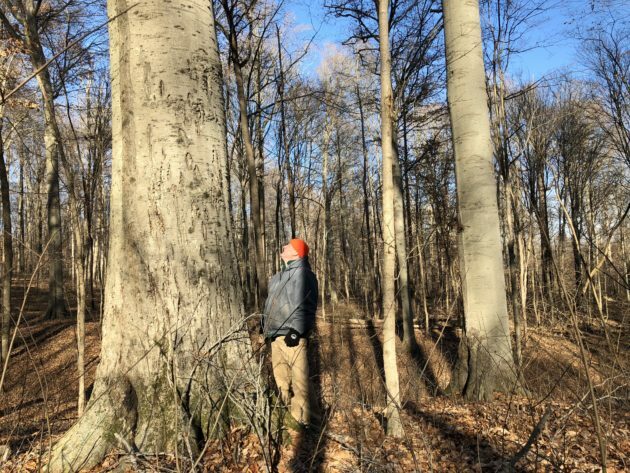 This past December, Sycamore acquired ownership of Hoot Woods, 80 acres of genuine (pronounced jen-u-wine in this instance) Hoosier homegrown Owen County old-growth forest. Not just old, but ancient. Evidence suggests it is one of the only stands of never-been-cut woods remaining in Indiana. Only 2,000 acres of old-growth remain in the state, of the 200 million acres of forest in Indiana at the time of European settlement. Countless studies have shown how important old-growth forests are to various species of plants and animals, especially in places where the forest has been so fragmented. Eighty acres of anything isn’t going to change the world single-handedly. But sometimes spirit matters as much as ecology. Knowing that there are places like this in southern Indiana, largely intact, remnants of a different time, going back possibly thousands of years — that says something about our values, about the quality we want our home to have. It says we care about what southern Indiana was because that’s a connection to what it can be. Because of the sensitive nature of this property, we do not plan to open Hoot Woods to general public use. We do plan to have some guided hikes for Sycamore members, so keep your eye on sycamorelandtrust.org/events for more info. You can find more facts and articles on Hoot Woods at sycamorelandtrust.org/news/hoot-woods.